Kentucky looked to close out their 4-game road trip with a victory as they traveled to Richmond, KY to take on Eastern Kentucky Wednesday night. Behind 14 hits and 11 runs, including a 3-3 night with 4 RBIs from Katie Reed, Kentucky was able to secure the win. Jenny Schaper led off the scoring for the Cats with a solo home run in the top of the first inning, (Kentucky 1, EKU 0). After a scorelss second, the Cats would add three runs in the top of the third off an RBI-single from Katie Reed and an RBI double from Lauren Johnson, (Kentucky 4, EKU 0). The Colonels responded with a big inning of their own in the bottom of the third by scoring three unearned runs on a two-out walk followed by a single up the middle, (Kentucky 4, EKU 3). The Cats would stretch the lead back out in the fourth inning off an Abbey Cheek home run and another RBI single by Reed, (Kentucky 6, EKU 3). 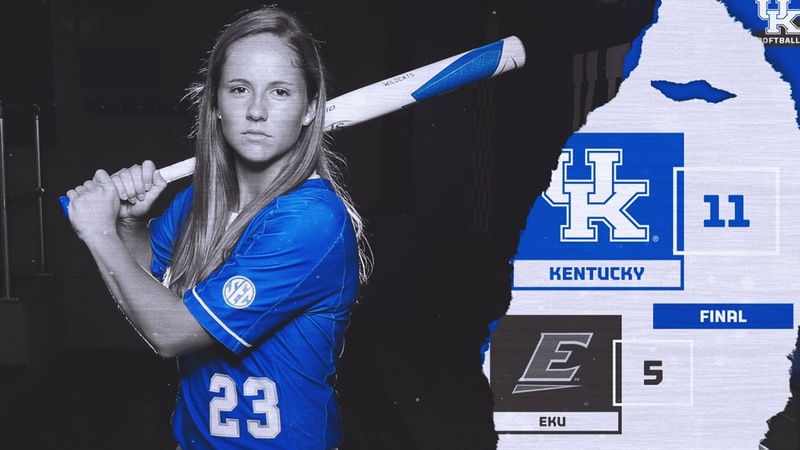 Kentucky would continue to pile on by adding one run in the fifth and 4 runs in the top of the seventh to ssecure the 11-5 victory over Eastern Kentucky. Kentucky hosts Ole Miss in a 3-game series starting Friday night at 6 p.m. ET. The game can be seen on SEC Network Plus.